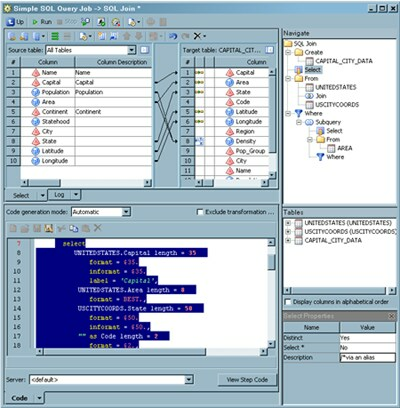 You want to view a clause, join, or table in an SQL query or modify its properties. Use the Navigate and properties panes on the Designer window for the SQL transformation to access and review the objects in your query. The properties pane for the clause, join, or table is displayed. The appropriate tab for the clause or join is displayed in a tab on the left side of the Designer window. When you click a table, the columns from the table are shown in a tab. If you click SQL Join, Create, or From in the Navigate pane, the SQL Clauses pane is displayed. If you click Select, Where, or one of the Joins in the Navigate pane, the Tables pane is displayed. The following display shows the Designer window for a sample job. Note that Select is highlighted on the Navigate pane, and the SQL code for the SELECT clause is highlighted on the Code tab. To highlight the code for a query object, right-click the object in the Navigate pane and click Find In. Then, click Code in the submenu. Also note that the Select tab, the Tables pane, and the Select Properties pane are displayed. You can use the properties pane that is displayed when you click an object on the Navigate pane to modify the object directly. If the properties window is not displayed, click Show Properties Pane in the toolbar at the top of the Designer window. For example, if you enter text in the Description field in the Select Properties pane, a comment is added to the SELECT clause on the Code tab. See the following display for a sample view of this behavior. Note that text entered in the Description field in the Select Properties pane is also displayed immediately before the SQL code on the Code tab. If you were to delete the text from the Description field, it would also be removed from the Navigate pane and the Code tab. Once again, you highlight the code with the Find In pop-up menu option. You can make similar modifications to any field in a properties pane for any object, unless the field is dimmed. Dimmed fields are read-only.